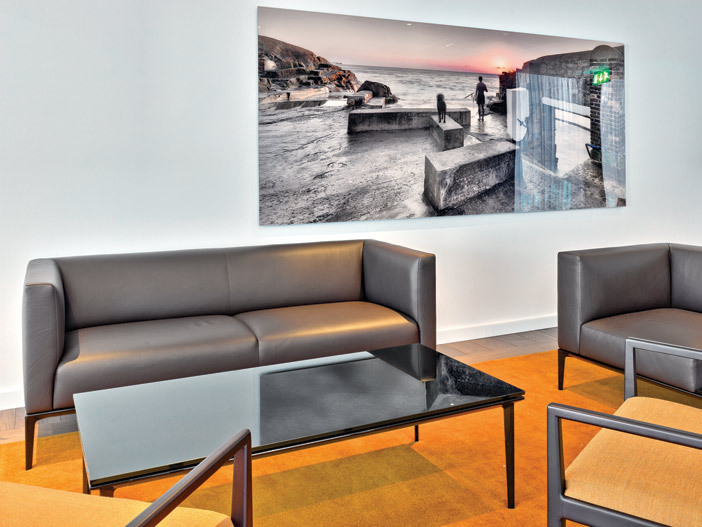 Opened in early 2013, the new 5-star Marker Hotel incorporates a 420 piece art collection which includes an 88 piece commission from photographer Enda Cavanagh. In this large-scale commission, the artist, gallery, architect, interior designer and commissioner collaborated to address the brief of the project and created a constant dialogue throughout the commissioning process. When the recession hit Ireland, the construction industry came to a halt and with it the development of the ‘checker-board’ building at Grand Canal Dock, serving as a reminder of the boom times and their downfall. But in 2012, a beacon of light appeared when the building was acquired by Midwest, a Swiss-based group, and Brehon Capital Partners, and the project resurrected. The owners aimed to develop a five-star hotel, and something original in Ireland. To reflect the quality of their service, they decided that no corners would be cut, least of all the acquisition of art for the hotel. The company hired McCauley Daye O’Connell as architects and interior designers, who set out on a sourcing mission with a budget of €250,000 to find the perfect art for the hotel. It was during one of their expeditions that the architects came across Enda Cavanagh’s exhibition in the Copper House Gallery, which is owned by Fire. They put a call into Kevin McGillycuddy, managing director of Brehon Partners, who visited the exhibition and liked what he saw. McGillycuddy trained as an architect and felt very strongly that the hotel had to have art of the same standard as the hotel. “If you look at the hotel itself, which is evocative of the Irish landscape and coastlines, we wanted to integrate the artwork keeping in line with Irish artists. At the time as well, we knew that it was fairly tough economic times so we didn’t want to go too far to find the artist. And we thought it would be appropriate to use Irish-based artists,” he says. Dan Daye, director, McCauley Daye O’Connell Architects, says it was an enormous task because there was a significant budget to get through. Some 428 pieces were purchased or commissioned, including sculpture, print and photography. Enda Cavanagh’s body of work comprised 88 of those. Daye says seeing Cavanagh’s work printed at the Copper House Gallery made a big difference to the final selection. Cavanagh says the exposure from the exhibition certainly facilitated the purchase of the 88 pieces by Brehon. He adds that the architects were also hands-on. The Marker has embraced the artwork by bringing it right through to its restaurant menus and continuing to support the artist even after the commission. Leszek Wolnik, director of Fire and the Copper House Gallery, says Cavanagh is attracting several prestigious commissions around the world as a result. He adds that the Marker Hotel will get many benefits from placing quality art in its hotel. “There are so many studies that show productivity and creativity increase when there’s art in the workplace. A company that has art in the workplace is widely regarded as a progressive, caring and innovative company.